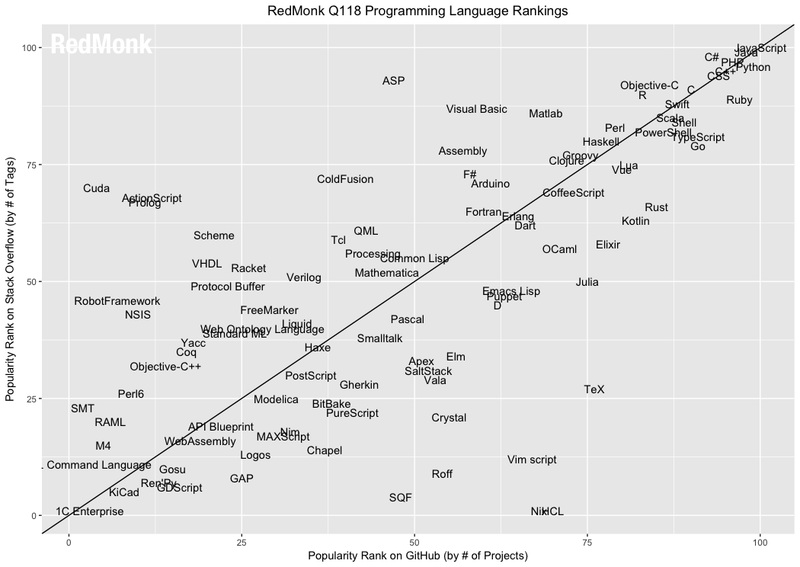 This iteration of the RedMonk Programming Language Rankings is brought to you by YLD. Experts in custom software development and pioneers in cutting edge technologies (Node, React); we enable you to innovate and stay ahead of the competition. Get in touch. Given that we’re into March, it seems like a reasonable time to publish our Q1 Programming Language Rankings. As always, these are a continuation of the work originally performed by Drew Conway and John Myles White late in 2010. While the means of collection has changed, the basic process remains the same: we extract language rankings from GitHub and Stack Overflow, and combine them for a ranking that attempts to reflect both code (GitHub) and discussion (Stack Overflow) traction. The idea is not to offer a statistically valid representation of current usage, but rather to correlate language discussion and usage in an effort to extract insights into potential future adoption trends. In January 2014 and again in January 2017, we were forced to make a change to the way that GitHub’s rankings were collected due to changes in the data’s availability. For more on these changes and the history of our rankings, see the summary from our last run. In the meantime, here’s how the rankings are performed currently. The data source used for these queries is the GitHub Archive. We query languages by pull request in a manner similar to the one GitHub used to assemble the 2016 State of the Octoverse. Our query is designed to be as comparable as possible to the previous process. We also had one other minor change for this run. Historically, our Stack Overflow tag counts have been collected direct from the source – stackoverflow.com. While this was the initial collection process, the spreadsheet containing our January 2018 tag counts became corrupted and unusable. With a helpful pointer from Stack Overflow itself, however, we were able to collect the required metrics using their useful data explorer tool. The results differed slightly from the website, but not materially as far as we can tell, but bear that it mind as a potential influence. With those updates out of the way, please keep in mind the other usual caveats. With that, here is the first quarter plot for 2018. As always, the consistent performance of our Tier 1 languages – the top ten, more or less – is at once surprising and unsurprising. The relatively static nature of the top ten languages is interesting, certainly, in a technology landscape that is best characterized not by the high level of change but the increasing pace of same. Conversely, however, it’s important to note that the numbers measured are accretive, and as with financial metrics rates of growth are fastest when projects are new and harder and harder to come by over time. New language entrants are behind from the day they are released, in other words, which makes displacing the most popular languages a significant and uphill battle. In our Top Ten, then, with one exception which we’ll come to, there is little to note. Outside of the top tier, however, there are several changes worth discussing. Go (-1): Since it burst onto the scene a little less than a decade ago, Go has been one of the fastest growing languages we’ve seen this side of Swift. Very few other languages have been able to vault themselves into the Top 20 as quickly as Go, a testament to its rock solid reputation as a back end systems language. That reputation notwithstanding, however, the evidence suggests that Go may have plateaued. After holding steady at 15 for two quarters, Go has watched Swift leapfrog it and for the first time in our rankings, actually fell off a spot down to #16. To be clear, we don’t recommend reading too much into the difference between one spot or another, even at the top of the rankings, but the trajectory doesn’t give much hope that Go will resume its rapid upward climb anytime soon. Nor does the language itself; while its reputation as a back end language is unquestioned, it lacks the versatility of comparable languages like Java that would grant it access to new markets and thus new growth. Kotlin: As we noted in our last run, the combination of Kotlin’s attractiveness to Java developers and its elevation to first class citizen on the Android platform seemed to indicate the language was poised for a major jump. In the course of little more than a year, Kotlin has gone from #65 to #46 in our Q3 run to #27 as of January. It didn’t quite match the performance of Swift, which managed a #68 to #22 jump in half that time, but Kotlin is now the second fastest growing language we have seen after Apple’s successor to Objective-C. Interestingly, the two languages have taken distinctively different paths to their respective rankings. Swift got its rankings largely through outperforming on the Stack Overflow axis of our rankings. This is the exact inverse of Kotlin, which performs well on GitHub, but whose relative community traction outside of Stack Overflow under-represents the language on that axis. Either way, Kotlin is one of the fastest growing languages in the world at present, and for good reason. What will be particularly interesting to watch is whether Kotlin can achieve a foothold in mainstream enterprise applications. This would give it an avenue for growth that Swift lacks at present. Rust (+3): The tortoise to Go’s original hare, Rust has continued its slow and steady ascent, checking in just inside the Top 25 for the first time at #23. This makes it more popular in these rankings than Clojure, Groovy, or Visual Basic, which is a significant achievement for a language that is prized for its safety but not considered as easy to pick up as other languages on this list. The question for Rust, much like Go, is what its broader appeal will be: that will determine whether it peaks in the back end of the top twenty or can continue to grow. Scala (-2): The question we asked about Scala in the first quarter’s rankings was simple: “the question facing Scala advocates and observers is whether or not this quarter’s decline is merely another blip, or the shape of things to come.” If this quarter’s run is any indication, the answer is the latter. For the third quarter in a row, it dropped, this time two spots to a tie for #14 with TypeScript. It’s unclear what the causative factors are here, and it’s important to note that a #14 ranking is still extremely high. That said, it will be interesting to see how much of the available oxygen for Scala is consumed by Kotlin as the latter continues to rocket up these rankings. Don’t get me wrong, frameworks have their place, but reinventing the wheel 3 dozen times doesn’t make a new tool, it just forces you to figure out how to use each wheel correctly. That’s going to add thousands of questions that are nothing more than extra work or an alias for another question. PHP developers don’t generally reinvent the wheel, and when they do, they usually call it a different language when the language pattern changes as much as it does from one framework to another. Um. I would suggest reading up the history of programming languages. Even today, there are a lot of programming languages around that are not related to C at all. What, lisp languages like clojure? I doubt that the common lisp repl isn’t written in C.
Implementation aside, syntax for most of the top 20 is derived from C.
I’m a fan of Ada (even though I admit it’s practically dead) so I’d be the first to agree that there are plently of languages not based directly on C.
All I can say is that my local (U.K.) railway signalling and air traffic control is written in (a controlled subset of) Ada. I’m not dead because of it! I think that there is a strong bias against Rust because of its built in package manager. Rust, especially for Linux users, feels familiar with the command line install util named cargo that retrieves packages from crates.io. Honestly, it feels a bit like comparing Linux distros’ application availability numbers without referencing their respective package managers. I know you guys can’t go through all the fringe stuff and smaller communities, however I just wanted to point out that Rust’s numbers are misleading due to lurking variables that couldn’t be accounted for because of Rust’s built in awesomeness. I’m a bit confused; how would the “built in awesomeness” of cargo (which I agree is indeed awesome) create a bias *against* Rust in these rankings? Less pull requests from github (understandably debatable, but based on my interpretation of cargos implementation), and less traffic on stack overflow due to the heavy focus on github for issue handling. I am somewhat new to rust, but I immediatly noticed the lack of conversation in stackoverflow found its way to github discussion because of cargo. True, but it’s been the largest institution outside of the Foundation pushing R, and a lot of R’s growth could be attributed to Microsoft’s considerable efforts across it’s stack and tooling. They forgot that Tex has its on stack.exchange site. Unlike most of the languages up there, TeX has it’s own stack exchange. Did you check there too? I bet it would affect it’s rank. That plot looks like it was done in R…. To embiggen. Love it! Just made the dictionary didn’t it. Likely because half of the Kotlin questions people might ask or find on Stack Overflow are answered by Java questions/answers. Swift’s rapid rise is expected and hardly surprising. 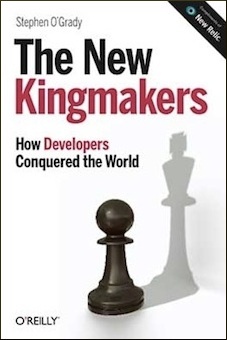 It’s because of the popularity of Apple development. Apple’s influence is enormous. However, Apple is not the entire world of IT. Not even close. It’s important to realize that outside of the Apple sphere, Swift has not gained much traction at all. By the way, the same remarks apply to Objective-C. In your methodology, what would happen if one added ObjC AND Swift? What position would they jump to? Amazing longevity. Thanks to Lionel and all the intel folks. WebAssembly as a target is already supported by Rust, soon Golang and other languages will come. The general architecture makes it easier to target such languages on wasm and it is harder to do that with JVM based languages. I don’t see SAS, Data Step, or DS2 in there anywhere. In some circles of predictive analytics, SAS would be considered #3 following R and Python, so while it isn’t quite as traditional as most of the other languages here, I’m surprised to see no SAS variant at all, anywhere. COBOL is alive and well!! !